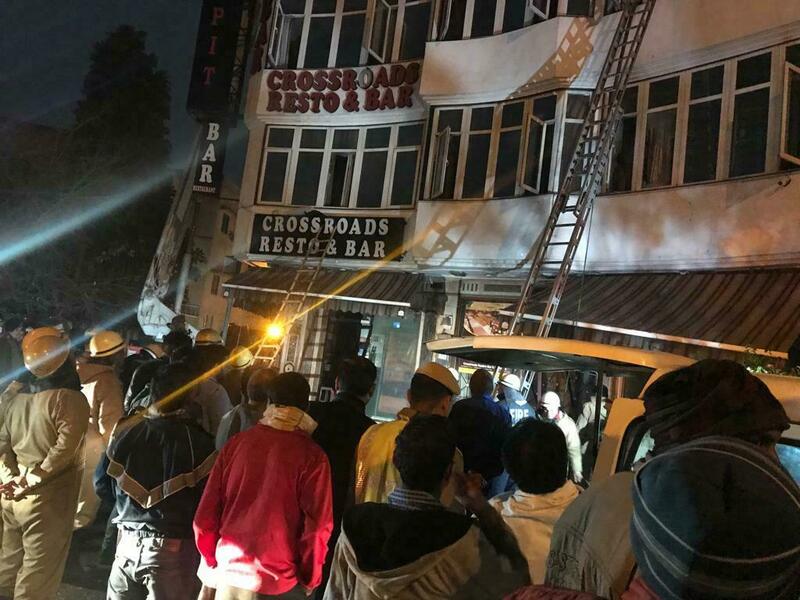 A fire has engulfed a shoddily built budget hotel in central New Delhi, killing 17 people and injuring at least four others, including a woman who leapt from an upper floor to escape the flames, Indian authorities said. Three of those killed at the Arpit Palace Hotel in Karol Bagh were members of a family who had travelled to the Indian capital from Kerala to attend a wedding, family friend Arvind Vishwanathan said outside a hospital mortuary. Most of the deaths – in an area in India’s capital city popular with tourists because of its shops and budget hotels – were due to suffocation, said Satyendar Kumar Jain, the Delhi government minister of health and urban development. The hotel developer had a permit from the fire department to build up to four storeys — the standard height in central Delhi – but the building appeared to have six floors, including a basement and a kitchen built on top of the roof, Mr Jain said. “Carelessness on the part of authorities is evident. We are going to investigate, and the wrongdoer will be punished,” he said. Hotel guest Sivanand Chand, 43, said he was jolted awake at around 4am, struggling to breathe. “When I got out of my room, I could hear ‘help, help!’ from adjoining rooms,” he said. The hallway was dark and thick with smoke, so Mr Chand turned back into his room and opened a window. He saw flames rising fast. A video shot by a worker at a nearby hotel showed flames consuming the top of the building, which authorities said contained an unauthorised makeshift kitchen formed from sheets of fibreglass. Mr Chand said rescue efforts were delayed because the first fire engines arrived with manual ladders that were not tall enough to reach his floor. He and some other guests were eventually escaped through his window on to a hydraulic lift. About 100 firefighters and 25 fire engines responded to the fire, which engulfed all but the ground floor of the hotel, fire officer Vijay Paul said. About three dozen people were rescued. Rescuers had to break windows to rescue people because wood panelling in the corridors and stairwells fed the flames, said fire official Atul Garg. “That is the escape route. People have to come out of the room and take the staircase but the staircase itself was on fire, so how they will go out?” Mr Garg said. Video showed firefighters carrying victims slumped over their shoulders through an unlit, charred stairwell. Authorities are investigating what sparked the blaze, Deputy Police Commissioner Mandeep Singh Randhawa said. Among those injured was a woman from Burma who sustained spinal injuries after jumping from an upper floor, according to Deputy Fire Chief Sunil Choudhary. She is being treated at a local hospital, he said. The other injured people were also taken to hospital but their conditions were not immediately known.